"Norland Township, Aitkin County, Minnesota"
This seven-year project traces the family roots back to the 1300's. Did you find an ancestor here? Randy will be happy to isolate and enlarge a copy of that person's photo and send or mail it to you. 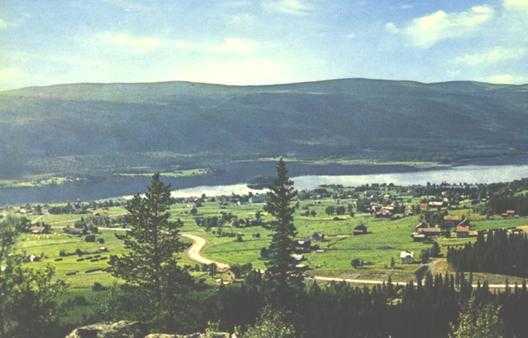 On Aug. 20th, 1934 in the County of Aitkin, in Nordland Township, on Elm Island Lake, at the Sjödin farm, a reunion was held to commemorate the 50th anniversary of Ole and Anna Sjödin coming to America from Klövsjö, Jämtland, Sweden. 200 emigrants and their descendants attended. 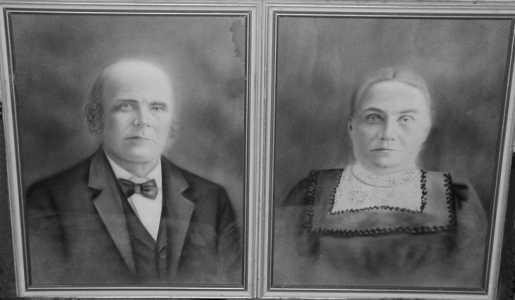 Here are the portraits of Ole and Anna (Olofsdotter) Sjödin, 1902, Aitkin, MN. Both were born in Klövsjö, Jämtland, Sweden and imigrated to Minnesota in 1883 with four of their children: Inga, Olof, John, and Alexander. Anna’s parents, Olof and Ingrid (Jonsdotter) Olofsson, also came with the group. Seven more children were born in Minnesota; Anna, Lewis, Morrill, Victor, Hulda, Tena, and Jennie. The town of Klövsjö, whose written history dates back to 1410 when it was under the rule of Denmark, can be traced back to the Stone Age. It had a population of 1,100 fifty years ago when the migration started to this country (1880's). 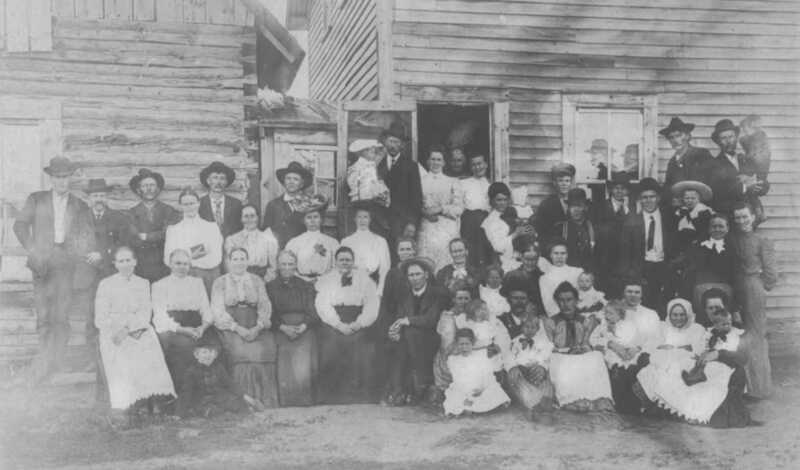 Now it is estimated that one-third of the original population came to Minnesota, the majority of whom settled in Aitkin County. The Sjödin farm in 1937. It was started in 1884 and is still there today. Thanks to Barbara Raffaelli for the picture. At the celebration John Berglund gave the history of the town, George Morine gave a talk in the original Klövsjö dialect and Mrs. Ida Pearson and the Rev. John S. Benson sang Swedish songs. Alex Sjödin of Rush City paid tribute to his mother. The picnic dinner serve included many of the old country dishes. (Can you image the smell of the Lutefisk for 300 plus people? Uff-da). Special thanks for the pictures and for identifying the names of everyone must go to Eileen (Sjödin) Karelis and her daughter, Diane. They spent endless hours researching all the people. Eileen grew up on the Sjödin farm. Click HERE for a larger photo with names. Here is a picture featuring the generation of "young ladies" who, along with their families, braved the journey to come to America. They all came from or by Klövsjö, Jämtland, Sweden and all settled near Aitkin, Minnesota. From their early years in Sweden to their golden years in Minnesota, they were always close friends. I live because I'm remembered! Mark your ancestors' graves! What a wonderful reunion. The towns of Aitkin and Klövsjö are still very close today. We are so happy to have visitors from the little Swedish village in the mountains. These pictures of the Sjödin reunion are also on display at the Klövsjö museum, with all the names of those present. Be sure to check it out when you are visiting there. Above is a picture of Klövsjö and the church, with Jonas Granberg's gravestone. Most of us are related to him. He was a very well known artist and designed church altars. You can see some of his work on the Klövsjö Kyrka (church) picture of the altar. This picture is of Klövsjö at midsommar (midsummer). "GROUP AT THE LINDER HOUSE"
This photo was taken at the Linder house in Glory, Nordland Township, Minnesota. April 1906. The house was located a half mile east of Erick & Mary Swanson's farm. This group was holding a meeting to start a church. When the picture was taken, Matt and Ida (Swanson) Nickander were living here. The Linders built the home and then moved out to the state of Washington. Click HERE for larger photos with names. 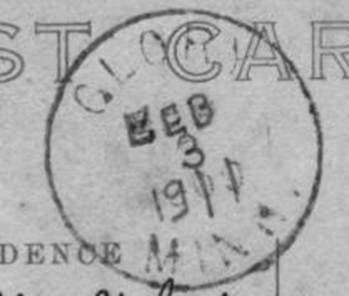 Erick O. Swanson, the postmaster at Glory, was married on Sunday afternoon last to Miss Mary Kolin of the same place. Rev. J. Hallstrom of this village performed the ceremony at the groom's home in the presence of a large number of guests, among whom were P. O. Erickson and sons, Frank and Victor; David West; Annie Swing; Paul Engquist, wife and son Edwin; John Mathson and family and Erick Munter, all from Aitkin. Rev. Bergman and wife attended from Deerwood. A wedding supper followed the marriage service. The young people have the best wishes of a large circle of friends. Click HERE for a larger view with names. 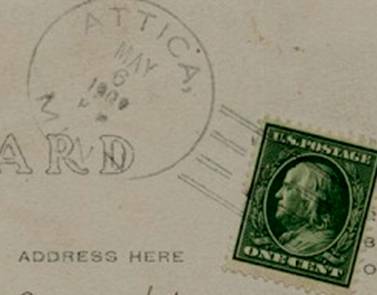 "Here are cancellations of the post office stamps for the towns of Glory and Attica, Nordland Township, Aitkin, Co.
Erick Swanson, my Uncle Ole, named and ran the post office and store at Glory. The Glory post office was in operation from 1901 to 1913 and the store until his death in 1948.